Brain science suggests focusing on the "why"
Are you excited about your work? Or does work make you feel like you need to “Shut off” in order to get through it? If you answered “yes” to the first question, you’re in the fortunate minority. According to both US and global Gallup polls, about 80 percent of workers don’t feel that they can be their best at work, and 70 percent are not engaged at work. What this means is that an overwhelming majority of the workforce is not “involved in, enthusiastic about, and committed to their work.” And 17 percent of that group are actively disengaged: they are repelled by what they do all day. It turns out that many organizations are deactivating the part of employees’ brains called the “seeking system,” which creates the natural impulse to explore, learn, and extract meaning from our circumstances, and releases dopamine—a neurotransmitter linked to motivation and pleasure—that makes us want to explore more. Exploring, experimenting, and learning is the way we’re designed to live and work, but it’s not the way most organizations are built. When our seeking system is activated we feel more motivated, purposeful, and zestful. We feel more alive. When it comes to activating our own seeking system and the stories we tell ourselves to find increased engagement in our work, the why of our behaviors is a more powerful story that the how. Both philosophy and empirical research suggest that the higher our level of interpretation or construal, the more we will stick with it when the going gets hard. Let’s look at this a different way. Let’s think about this in the context of trying to lose fifteen pounds. Maybe your doctor has told you that the extra weight is unhealthy. How might making the tough, daily decisions to maintain a healthy diet depend on your story about why you eat? Consider your choice between a healthy salad and a pizza for lunch after the fourth day on your diet. If you tell yourself a low-level construal story of why you eat, you would focus on how your body feels. This story would focus you on your physical sensation of a gnawing tummy and the unpleasant psychological sensation of being hungry. And then you look at the salad. It looks lame. As Wharton professor Katherine Milkman and her colleagues say, “A low- level construal of a salad would focus on its taste and its likelihood of leaving you hungry.” If your story of why you eat centers on your body, right now, and you are thinking about the salad’s ability to fulﬁll your immediate physical prompts, you will likely get the pizza. And most diets end this way— unsuccessfully. If, however, you tell yourself a high-level construal story of why you eat, you might focus on your health, and your long- term goals of losing ﬁfteen pounds. With this story, why would you put something unhealthy in your body that would add weight and make your heart work too hard? Says Milkman, “A high-level construal of a salad would focus on the salad’s healthfulness and its likelihood of increasing longevity.” The story you tell yourself about eating changes your behavior, and you are more likely to choose the salad. Twenty minutes later, when your snarling belly is appeased, you feel pride instead of guilt. When we personally understand and believe in the why of our actions, we have greater resilience and stamina when the going gets tough. But really it depends on what you think you are doing. If you are using a low level of construal, focusing on your physical body and how it feels right now, you might think of the act of exercise as “moving my legs.” If this is how you see it, it makes sense to stop running and walk when going up the hill hurts. Why would you want to hurt? If there is no good answer in your story, then it’s all pain with no gain. What’s the point? Same thing if your day starts getting busy with meetings and other demands: it’s painful to try and keep that forty- ﬁve minutes open for exercise and a shower. And so, when the schedule gets tight, the exercise gets cut. But what happens if your story about exercise is “to make my day better with endorphins”? Endorphins are morphine-like chemicals produced by the body during exercise that trigger positive feelings. If this was your story, you might lean a little farther into the same level of discomfort when your heart rate makes itself known. Because this story means that the discomfort has a point—it allows you to reinterpret the same signal from your heart rate differently. Yes, there is discomfort, but in fact this is a signal that your exercise is working this elevated heart rate releases endorphins and gives you positive feelings and a sense of accomplishment as you go through the rest of your day. The point here, of course, is not that you should change your story about why you eat or exercise (although endorphins are free, legal, good drugs that make life a better place to be). The broader point is to think about how the same behaviors and activities take on very different meaning to us depending on the stories we tell ourselves about what we are doing. If we choose more meaningful stories about our work based on personal experience and interpretations of our impact, we can light up our seeking systems and change our motivation, perseverance, and resilience in the face of adversity. Reprinted with permission from Harvard Business Review Press. Adapted from Alive at Work: The Neuroscience of Helping Your People Love What They Do. Copyright 2018 Daniel M. Cable. All rights reserved. 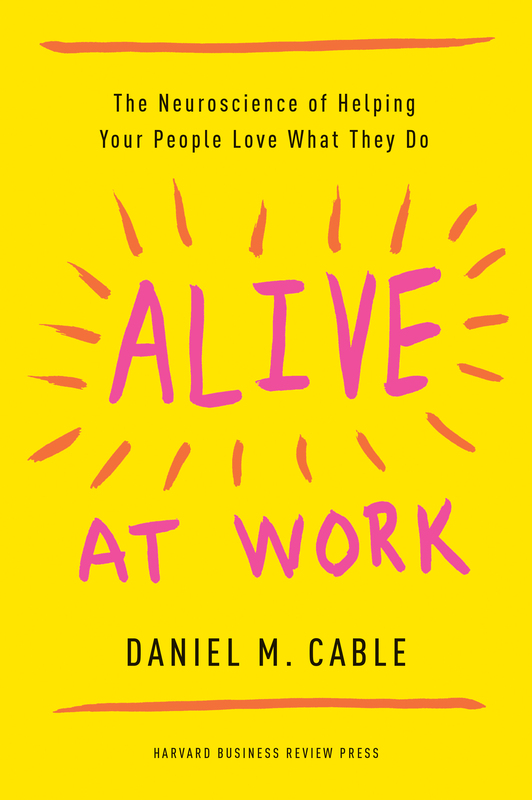 Daniel M. Cable is a Professor of Organizational Behavior at London Business School, and author of Alive at Work: The Neuroscience of Helping Your People Love What They Do.